Zara basic tee, Vintage fisherman's sweater, Gypsy Warrior Hidden Star jacket, J Brand skinny cargo pants (on sale here), Sam Edelman Zoe boots, thrifted necklace (last seen here), Rebecca Minkoff backpack (last seen here). One of my favorite things about fashion is that it inevitably comes full circle. I love watching trends come and go, only to be revived a few decades later. My latest obsession? The denim jacket. I remember so well the day I bought my first jean jacket (Earl Jean, anyone?) in highschool, and I LOVE that the style has come back hotter than ever. Paired with a full denim-on-denim look or a comfy, chunky sweater (like Micol did here for a fun Sunday full of brunch and football) and it's surprising that we ever let this staple migrate to the back of our closets. Love this look and love how you layered for the fall. Heck yes, into this look in it's entirety! 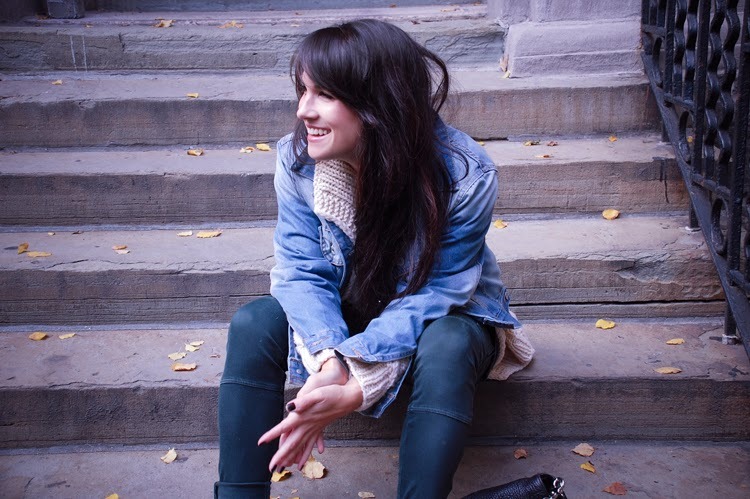 Love how you wore this denim jacket for Fall! very cozy chic! love it! I love the colored cargo denim with the denim jacket! This is look is perfectly undone with just enough chic! Cool look and very evergreen them denim jackets.. I am drooling over that soft looking bag, yum! Loving that chunky sweater layered with the denim jacket. Ahh, I just posted a pic with my old sam's..such a fun boot. Looking cozy!